Poll: Have Breakdowns Caused You to Break With Metro? Offloading. Trains out of service. Delays. Complaints about the Wiehle-Reston East Kiss-and-Ride. Just another morning on Metro these days. 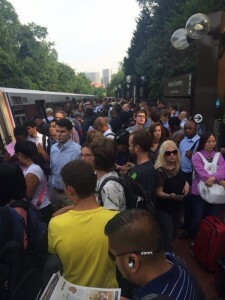 Fifteen months after the Silver Line opened in Reston, it seems many daily commuters have joined the chorus all over the DC area bemoaning the many rail service issues. There has been no shortage of headlines lately about problems with the Metrorail system, not to mention real-time tweets of frustration during rush hour. A Metro riders union has also recently formed. Metro says it’s trying to catch up, but even the maintenance is causing problems. This weekend alone, “reconstruction of the Metrorail system” will result in “service adjustments” on every line other than the Green Line. The Orange, Silver, Blue, Yellow and Red lines will all see 24 minute lags between trains. Metro acknowledged last week that service breakdowns may be responsible for steadily decreasing ridership. The rail system also announced Thursday it has formed Amplify, a “customer community” where riders can share opinions and help shape the direction of Metro, WMATA said in a statement. Are you sticking with Metro or are you driving to work more often this year as a result of less reliable service? Take our poll and tell us your thoughts in the comments.